Life is just a bowl of…ch...no, not cherries! When the New England Patriots and the Atlanta Falcons square off at Super Bowl Sunday on Feb. 5 in Houston, odds are that feathers will fly and football fans will flock to heaping bowls of chili. All chili aficionados have their favorite recipes, but white chili proved to be the winning alternative to red chili at the annual Solano County 4-H Chili Cookoff, held Jan. 14 in the Community Presbyterian Church in Vallejo. 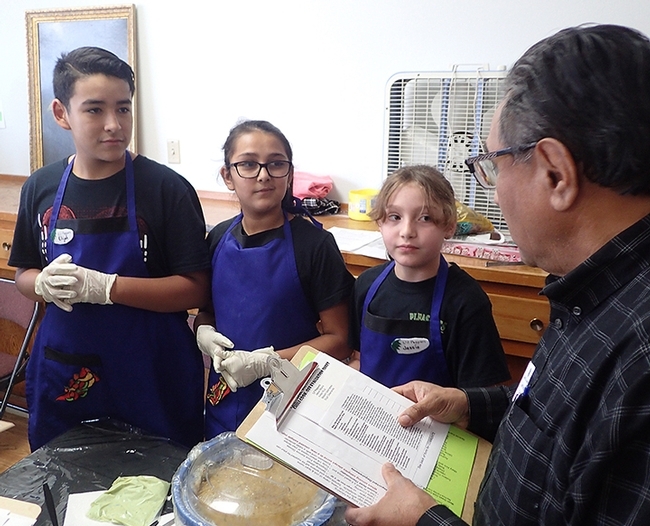 The Lil' Peppers — three members of the Pleasants Valley 4-H Club, Vacaville — took home top honors with their “White Chili with Avocado Cream.” It was like putting a feather in the caps of chefs Jessie Means and Elijah Desmarais and his sister Maleah Desmarais. Advised by their cooking leader Marlene Means, they made the dish at home, delivered it to the cook-off in a crockpot, and answered a series of questions from four-judge panel. They based their entry on a Cooking Light magazine recipe, but added agave to suit their tastes (they acknowledged they're not partial to one ingredient, serrano chile). They also substituted a can of white beans for a 15-ounce can of unsalted chickpeas (garbanzo beans). 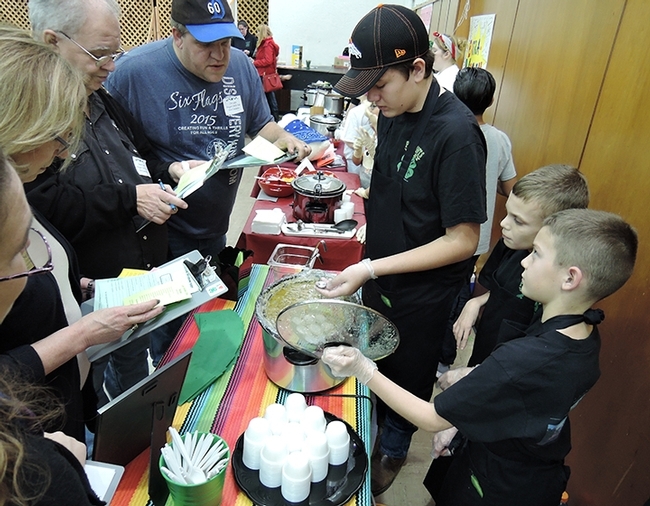 The cook-off, which drew a total of five teams, was part of the Solano County 4-H Project Skills Day, an opportunity for youths to showcase what they've learned in their projects and to hone their display and presentation skills. The day ended with the cook-off. The chili judges — John Vasquez Jr. of Vacaville and Skip Thomson of Dixon, both members of the Solano County Board of Supervisors; and fellow chili enthusiasts Robert Reed of Benicia and Will Cant of Vallejo — said they enjoyed all the dishes, but especially the chicken chili. They went for seconds. “It was really good,” said Vasquez, a veteran cook-off judge, praising the intermingling of the flavors and the competence of the chefs. 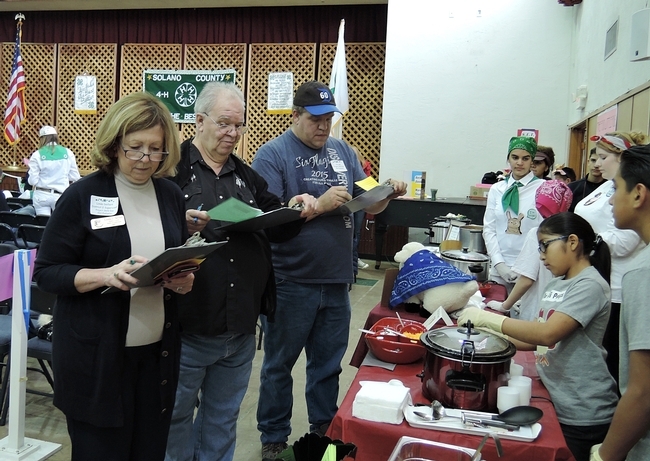 Coordinator Connie Reid of the Sherwood Forrest Club in Vallejo escorted the judges to each team's table, where the 4-H'ers introduced themselves and talked about their chili, the ingredients, the preparation and the outcome. The Lil' Peppers' project all started with Jessie Means wanting to participate in the cook-off. She asked her mother and 4-H cooking project leader, Marlene Means, to help, and then Jessie recruited Elijah and Maleah Desmarais. What to prepare? At most cook-offs, teams make red chili. The Lil Peppers decided on white chili, made with chicken and pork instead of beef. For the cook-off, they donned blue aprons appliquéd with chili peppers, made by Jessie. They kept the decorations simple: a black tablecloth graced with a few chili peppers. It was a great learning experience, Marlene Means said. 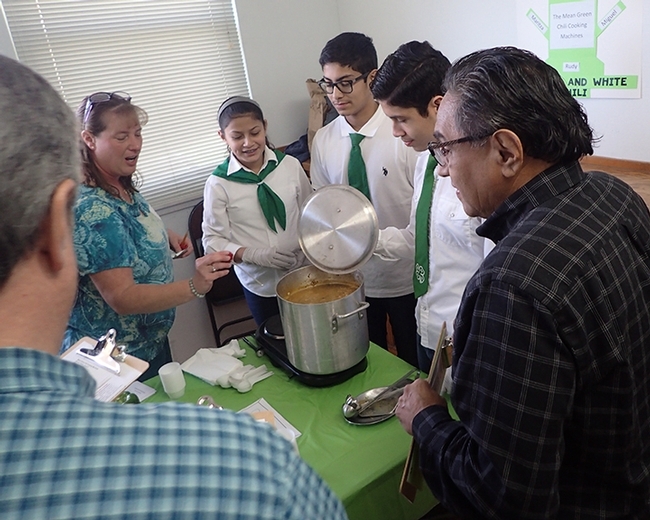 When the 4-H'ers tasted their finished product, they decided it was "a little too spicy!” So they added a tablespoon of agave. The end result: the team loved it, the judges loved it, and so did the crowd that grouped around their entry for samples. “There were many repeat tasters,” Marlene Means said. All three members of the Pleasants Valley 4-H Club are enrolled in cooking projects, but also a variety of other projects. Jessie, the club's historian, is enrolled in swine, rabbits, horse, sewing, food preservation, cooking, outdoor cooking, indoor mini gardens, baking and bread making, and dog care and training. Maleah is enrolled in fine art, outdoor cooking, rabbits, and cooking projects, while Elijah's projects are poultry, outdoor cooking and rabbits. All the cook-off teams delighted in creating their own costumes. 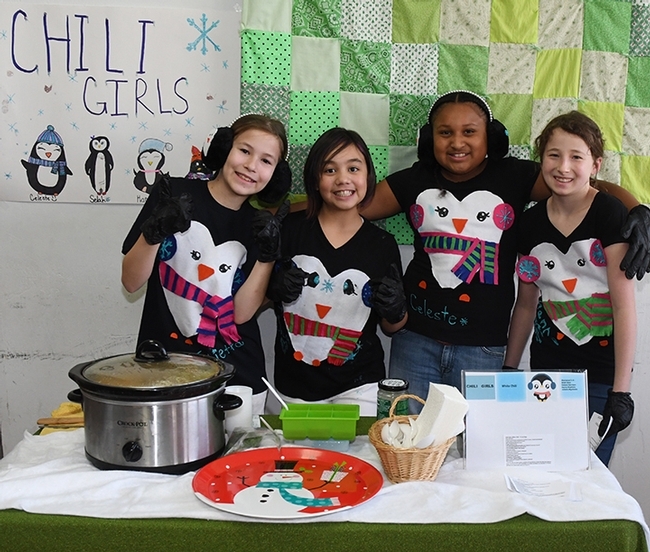 The Chili Girls of Sherwood Forest 4-H Club, Vallejo, dressed as penguins. Two Harry Potter fans from the Tremont 4-H Club, Dixon, opted for "tie attire." 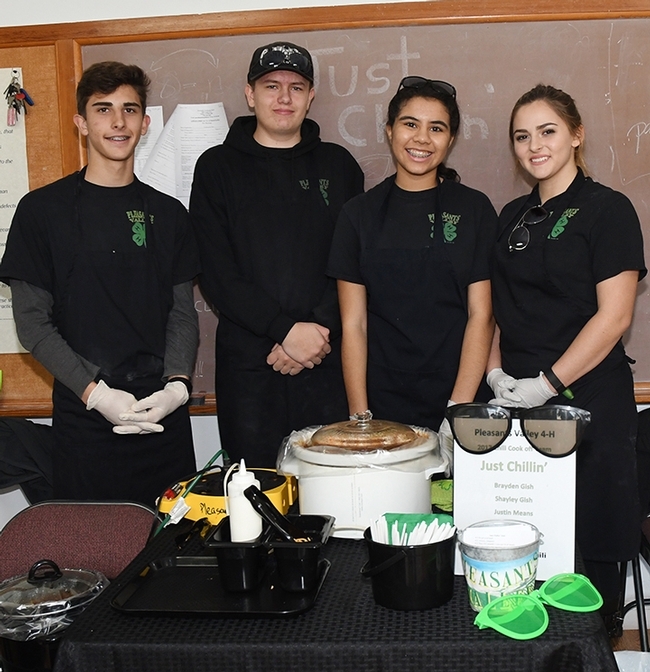 Another team from the Pleasants Valley 4-H Club, Vacaville, donned sunglasses; they were just chillin' when they served a chili reportedly favored by "The Duke" (John Wayne). 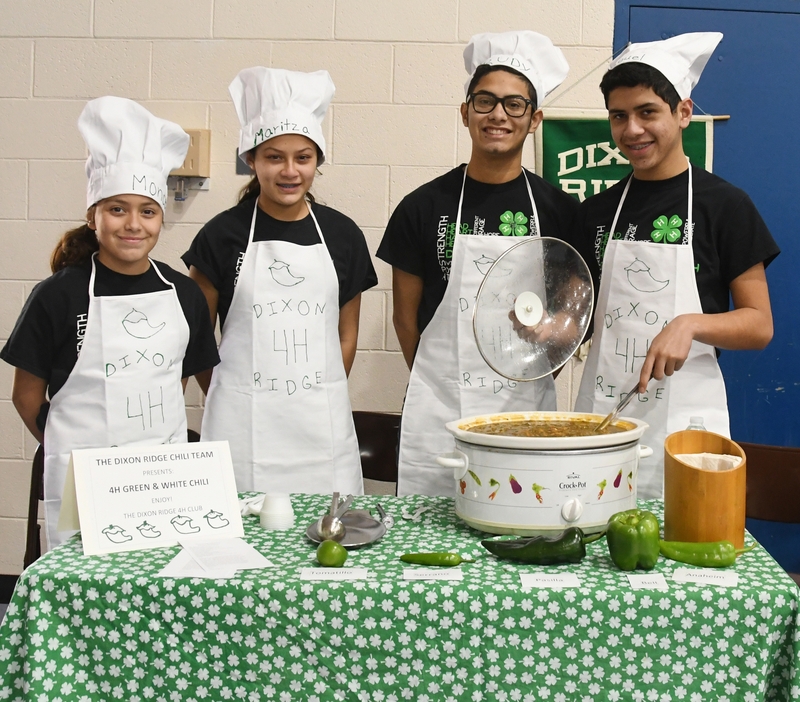 Another group from Dixon, the Mean Green Chili Cooking Machine of the Dixon Ridge 4-H Club, came as themselves, in 4-H attire. Their chili lived up to their name; it was the hottest and was quite delicious, the judges agreed. Arrange first 3 ingredients on a foil-lined baking sheet. Coat with cooking spray. Place pan on middle oven rack; broil 15 minutes or until charred on all sides, turning occasionally. Wrap peppers in foil; let stand 5 minutes. Peel peppers; discard peels, stems, and seeds. Combine peppers, onion, 1/2 cup stock, flour, adobo sauce, chipotle, and 1 can cannellini beans in a blender; process until smooth. Heat a large Dutch oven over medium-high heat. Add oil to pan; swirl to coat. Add garlic to pan; sauté 30 seconds. Add cumin, oregano, and coriander to pan; sauté 30 seconds. Add pork; cook 4 minutes, stirring to crumble. Stir in onion mixture and remaining 3-1/2 cups stock. Bring to a boil; reduce heat, and simmer 20 minutes, stirring frequently. Add chicken to pan; cook 5 minutes. Stir in remaining can of cannellini beans, corn, and white beans; cook 7 minutes. Reduce heat to medium-low. Stir in half-and-half, 1/2 cup cilantro, and 1/3 cup juice; cook 3 minutes. Stir in 2-1/4 teaspoons salt. Place avocado in a small bowl; mash with the back of a fork. Stir in sour cream, remaining 1 1/2 teaspoons juice, and remaining 1/8 teaspoon salt. Serve chili with remaining 1/4 cup cilantro, avocado cream, and tomatillo. The Solano County 4-H Youth Development Program, part of the UC Cooperative Extension Program of the UC Division of Agriculture and Natural Resources (UC ANR), follows the motto, “Making the best better.” 4-H, which stands for head, heart, health and hands, is open to youths ages 5 to 19. In age-appropriate projects, they learn skills through hands-on learning in projects ranging from arts and crafts, computers and leadership to dog care, poultry, rabbits and woodworking. They develop skills they would otherwise not attain at home or in public or private schools, said Williams, who may be reached at vawilliams@ucanr.edu for further information on the program. 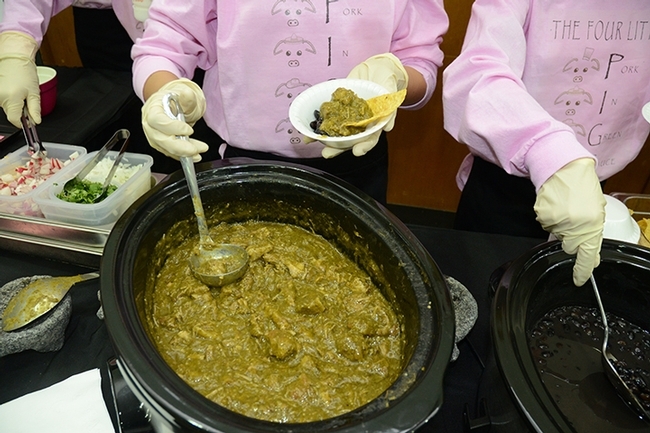 Their first time proved to be the charm — just as Super (souper) Bowl Sunday beckons. 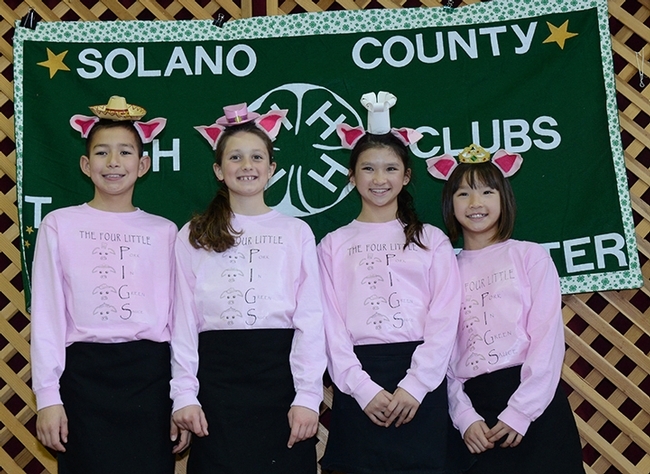 Using a grandmother's favorite recipe and all locally grown ingredients, the Four Little PIGS (Pork in Green Sauce) from the Suisun Valley 4-H Club swept the five-team competition at the Solano County 4-H Chili Cook-Off. 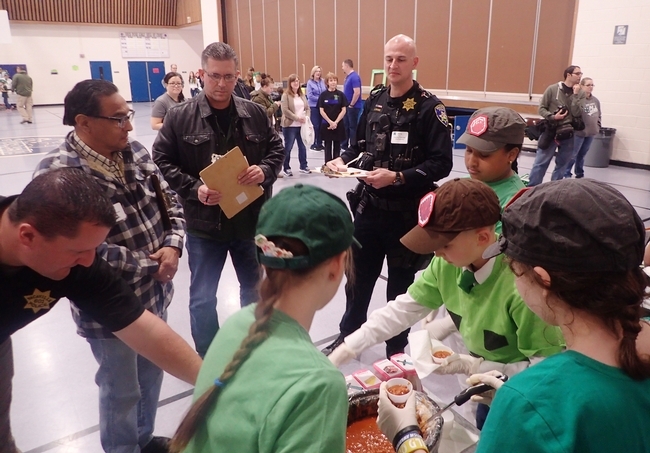 The event took place at the Solano County 4-H Project Skills Day in the Community Presbyterian Church, Vallejo. The quartet — Spencer Merodio, 10, Alexis Taliaferro, 11, Natalie Frenkel, 12, and Kate Frenkel, 10 — drew a round of applause as they appeared on stage to accept the award, movie tickets to the Brenden Theatre. It was their first time entering the annual competition. The Suisun Valley 4-H'ers opted for Spencer's grandmother's recipe, “Chili Verde, aka Pork in Green Sauce,” using cubed pork shoulder, tomatillos, jalapeno peppers, cilantro, garlic cloves and black beans. The condiments: sour cream, cilantro and diced radishes. 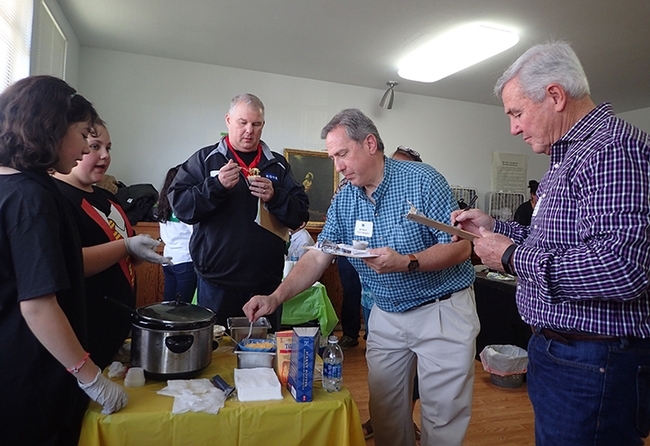 Competition proved keen, as all the dishes were delicious, the evaluators said. “I could eat any of the five chilis any day of the week,” said James Luka, a retired network administrator for the U.S. and Europe stock market in Illinois. 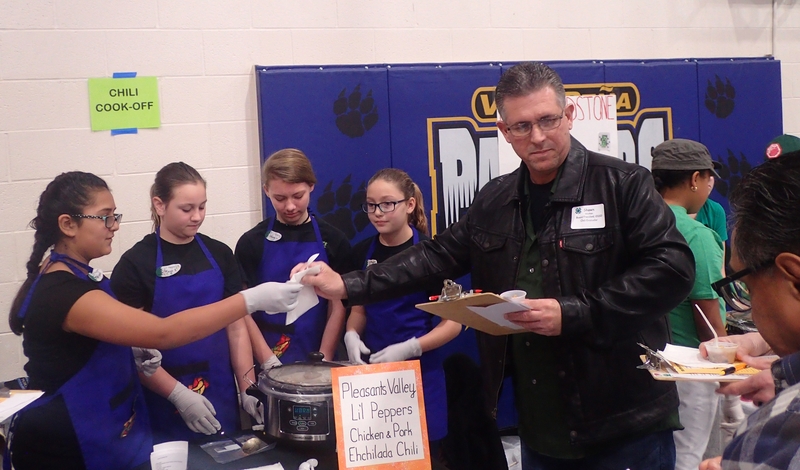 The evaluators praised the flavor and texture of the champion chili, but also the enthusiasm of the presenters and their eagerness to share the recipe and answer questions. For the occasion, the youths wore special pig costumes. They decorated their long-sleeved pink T-shirts with pig drawings and lettering on both the front and the back. An added touch: little chef hats, complete with pink pig ears. 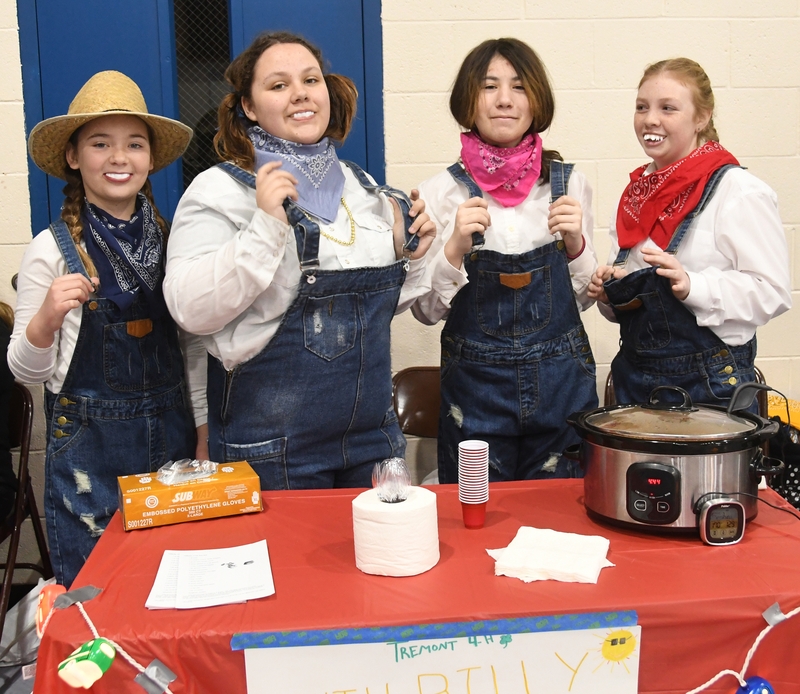 The members of the championship team are enrolled in their club's food and nutrition project and other projects, including Science, Engineering and Technology (SET) and outdoor adventures. 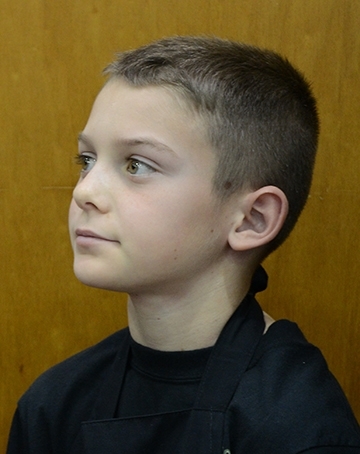 “They're all close friends and competitive swimmers,” said Spencer's mother, Heather. They swim competitively with SASO of Fairfield-Suisun, which holds practices at Solano Community College. Peel and rinse tomatillos. Add tomatillos and jalapeños to sauce pan and cover with water. Bring to a rolling boil and watch for tomatillos to change color. Add garlic and cilantro to a blender followed by tomatillos and peppers from boiling water, reserving water. Blend with up to 1/2 to 3/4 cup water from pan depending on the consistency desired. Set sauce aside. Season cubed pork generously with salt and pepper. Sear meat over high heat and par cook. Sauté onions and garlic until golden and caramelized. Add sauce to pan and scrape pan bottom to release cooked ingredients. Stir in onions, garlic and pork. Simmer for two hours and serve with minced onions, radishes, and cilantro on top, and a warm tortilla as desired. Heat olive oil in a large pot over medium heat then add the onions and garlic. Cook for a few minutes until onions soften. Add the chicken and cook until lightly browned. Add 3/4 of the beer, reserving the rest, then cook for a couple of minutes to reduce. Add the tomatoes, chipotles, beans, chili powder, cumin and salt. Stir to combine, then cover the pot and cook for 1 hour. Combine the masa harina with the rest of the beer and stir to make a paste. Add this into the chili, along with the lime juice. Stir and cook for 10 more minutes or until thick. In a large stock pot, brown pork in the olive oil. Add in the ground beef and continue cooking over high heat until beef is browned (about 30 minutes). Add the water and seasonings. Cook an additional 30 minutes. Add tomatoes and beans. Turn down the heat and simmer for 30 minutes. While mixture is simmering, coarsely chop onions and peppers and finely chop garlic. Add these to the pot and continue cooking until pork is tender ( about another 30-45 minutes). Check flavor and add seasonings to taste. If needed, thicken chili with cornstarch. In a large heavy skillet, roast corn kernels over medium­high heat, stirring constantly, until beginning to brown, 3 to 5 minutes. Remove and set aside. Add 2 tablespoons of olive oil to the skillet over medium heat and cook eggplant, red bell pepper, and green bell pepper with a pinch of salt until golden, about 10 minutes. Add the bulgur and stir until well combined. Set aside. In a large saucepan, heat remaining tablespoon of oil over medium heat. Add garlic and cook for 1 minute, then add onion and cook until translucent, about 5 minutes. Stir in jalapeño, cumin, cinnamon, coriander, paprika, chili powder, salt and pepper. Cook for 1 minute, stirring frequently. Stir in tomatoes, beans, vegetable broth and lime juice. Bring to a simmer. Simmer 15 minutes, stirring frequently. Stir in corn and eggplant. Add chocolate and stir just until melted. Taste and adjust seasoning. Brown the meat, add spices and sauce, then onions, peppers and cook on medium high in a large pot on the stovetop for about 2 hours or until meat is done. Add corn starch to thicken. Many young adults entering the workforce know little about meal preparation. Not so for those enrolled in the foods and nutrition program in UC Agriculture and Natural Resources' (UC ANR) 4-H Youth Development Program. 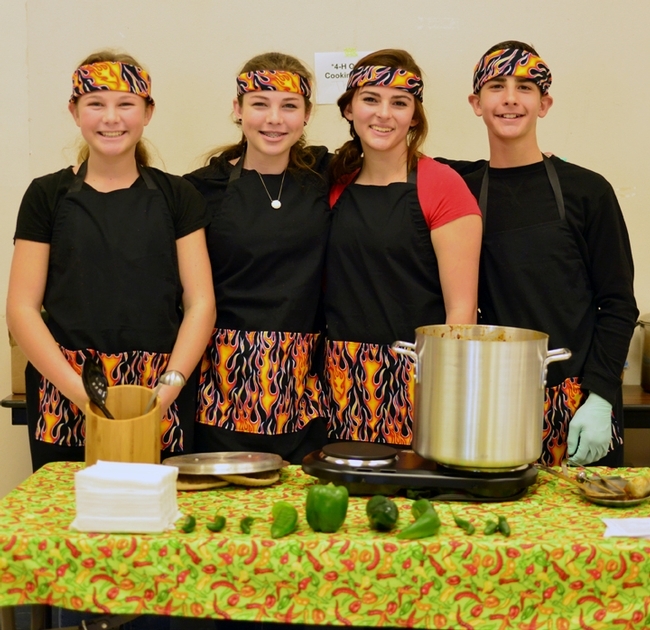 Youths as young as five learn how to prepare healthy nutritious food. And yes, they learn how to make desserts, such as special treats for their family and friends at Halloween. 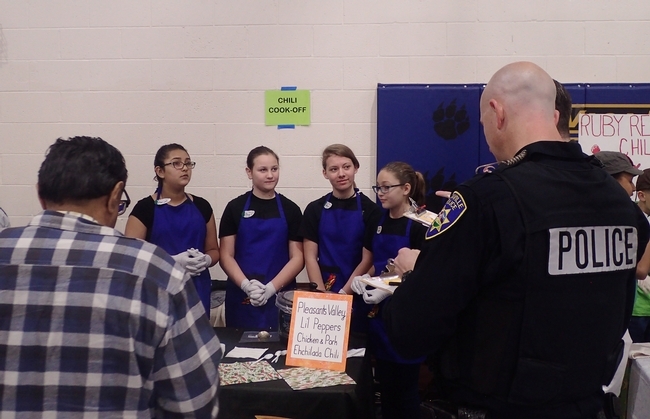 Former Solano County 4-H All-Star Ambassador Julianna Payne was so interested in the foods and nutrition project offered by the Sherwood Forest 4-H Club, Vallejo, she plans a culinary career. "That's where I found my love of cooking and most especially, baking," said Payne, 19, who just completed her 14th year in 4-H, including 10 years in foods and nutrition. 4-H is administered by UC ANR Cooperative Extension offices in every California county. The program focuses on leadership and life skills. "I believe that one of the most important life skills a person needs is knowing how to cook for themselves," Julianna said. Payne, a 2014 high school graduate, is in her second year at Solano Community College, Fairfield. In the spring, she plans to attend an area culinary school to earn her associate degree in baking and pastry. "During my 10 years in the food and nutrition project, I made so many things I could not even begin to count," she recalled. "I have made savory things like tamales, empanadas, raviolis, and chilis and I have made sweet things like, peppermint bark, pumpkin scones, toffees, and chocolate orange cupcakes." 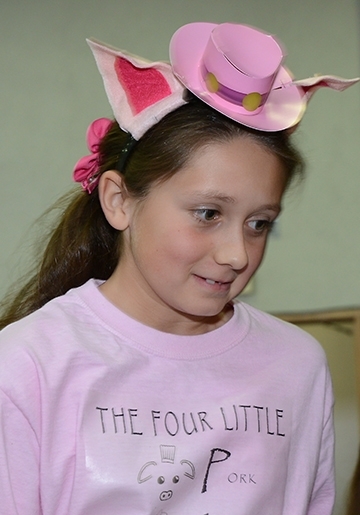 Julianna, who joined 4-H at age 5, went on to serve as president of her club for three years. Her experience, enthusiasm and commitment to 4-H led to her being selected for the county's highest 4-H honor: Solano County 4-H All-Star Ambassador. Her mother, Sharon Payne, is a former community leader of the Sherwood Forest 4-H Club and a past president of the Solano County 4-H Leaders' Council. So it's not surprising that the youth development program (now in the midst of enrolling new members for the 2015-2016 year) nurtures interests, teaches life skills and molds careers, including culinary careers. As for Julianna Payne, she is continuing to hone her skills. 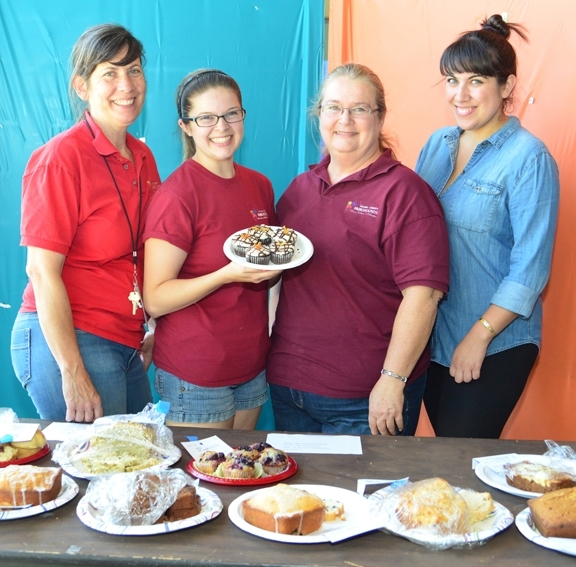 She entered her gluten-free chocolate/orange cupcakes at the recent Solano County Fair, Vallejo and drew rave reviews from the judges, staff and volunteers who sampled the cupcakes. Soon she will be teaching other 4-H'ers as she herself was taught. “I plan on giving back to 4-H this year by becoming a project leader myself," Julianna said. 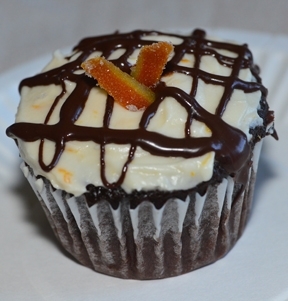 "I will be teaching a cupcake project for 5-to-8-year-olds in the Sherwood Forest 4-H Club." Heat oven to 350°F. Line about 30 muffin cups (2-1/2 inch in diameter) with paper or foil baking cups. Stir together sugar, flour, cocoa, baking powder, baking soda and salt in large bowl. Add eggs, milk, oil, orange juice, orange zest and vanilla; beat on medium speed of mixer 2 minutes. Stir in boiling water (batter will be thin). Fill cups 2/3 full with batter. Bake 22 to 25 minutes or until wooden pick inserted in centers comes out clean. Cool completely in pans on wire rack. Makes about 30 cupcakes. In a large bowl, beat together the butter and cream cheese with an electric mixer. With the mixer on low speed, add the powdered sugar a cup at a time until smooth and creamy. Beat in the vanilla extract the orange juice and orange zest. Melt chocolate in a bowl over a double boiler. Drizzle over cupcakes. Peel the orange and cut into 1/4 inch slices. Boil in water until tender. Drain. Heat sugar and water in pot until dissolved. Simmer orange peels in sugar water for 30 minutes. Set on cooling rack to cool. Once cool, toss in granulated sugar and set as garnish on top of cupcakes. Enjoy. 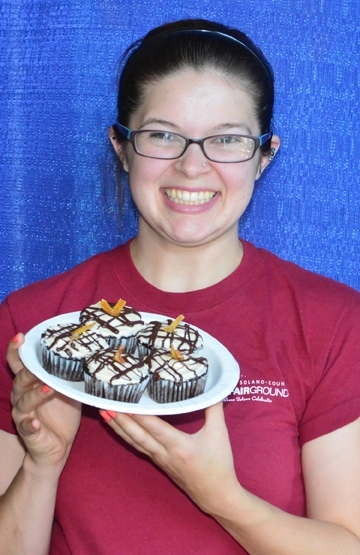 Julianna Payne's cupcakes were a big hit at the Solano County Fair. From left are Gloria Gonzalez, superintendent of McCormack Hall; Julianna Payne; Sharon Payne, assistant superintendent; and Angelica Gonzalez, staff. (Photo by Kathy Keatley Garvey). 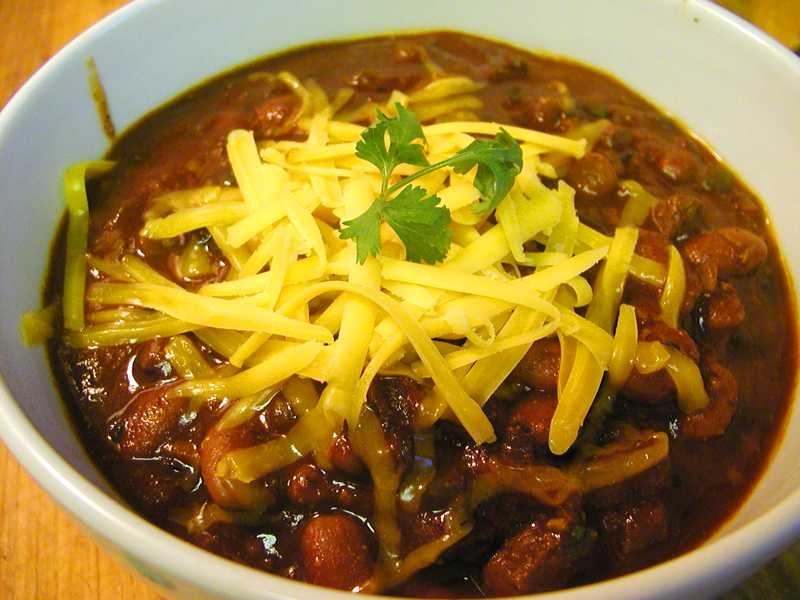 Get a winning recipe for chili, just in time for the Super Bowl. If it's Super Bowl time (and it is on Sunday, Feb. 1, when the Seattle Seahawks and the New England Patriots clash for the National Football League championship), it's also time for a "Souper Bowl." A souper bowl of chili, that is. Question is, which recipe to prepare? Well, the Solano County 4-H Youth Development Program to the rescue. Every year the Solano County 4-H Project Skills Day includes a Solano County 4-H Chili Cookoff. Teams sign up, prepare their chili in advance, and transport it in a crockpot or slow cooker to the venue (this year it was the C. A. Jacobs Middle School in Dixon). They field questions from the judges, who sample it, score it and select the winning team. This year's winner was a pepper-loving team that used four different kinds of peppers and the secret ingredient — love. The group, all members of the Dixon Ridge 4-H Club and enrolled in the countywide Outdoor Cooking Project, chose Pasilla, Serrano, Anaheim and green bell peppers and also displayed "specimens" in front of their crockpot. Team members Quincy and Fallon Decious and Shaley and Braydon Gish said they plan to make the chili for their families on Super Bowl Sunday. “It's really good,” they all agreed. While preparing the peppers, they said they wore “doctor gloves” to prevent the potent pepper oils from reaching their skin. The judges praised the flavor and texture, the display and their enthusiasm. 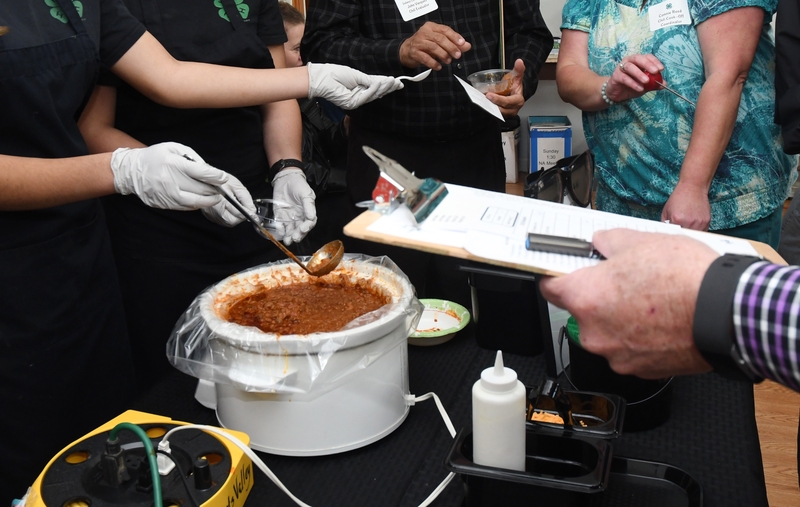 Judges were Cutter Hicks, reporter with the Dixon Tribune; Jim Nessen of Dixon, who works for a data company in Sacramento, and Kathy Keatley Garvey, a University of California, Davis employee and a longtime 4-H volunteer and food columnist. 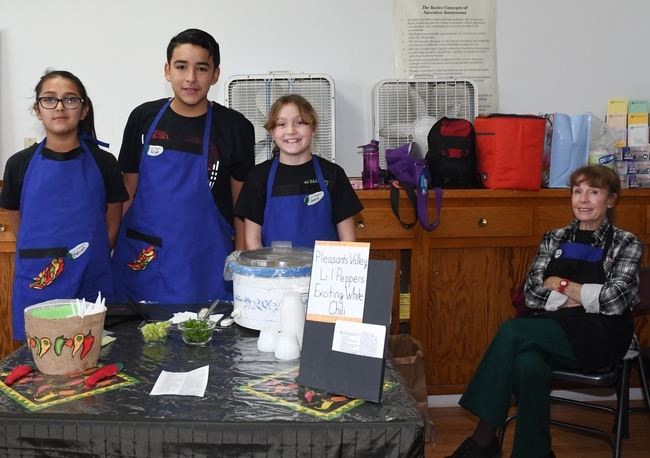 Valerie Williams, Solano County 4-H Program representative, said the cookoff competition teaches the participants public speaking as well as cooking and presentation skills. 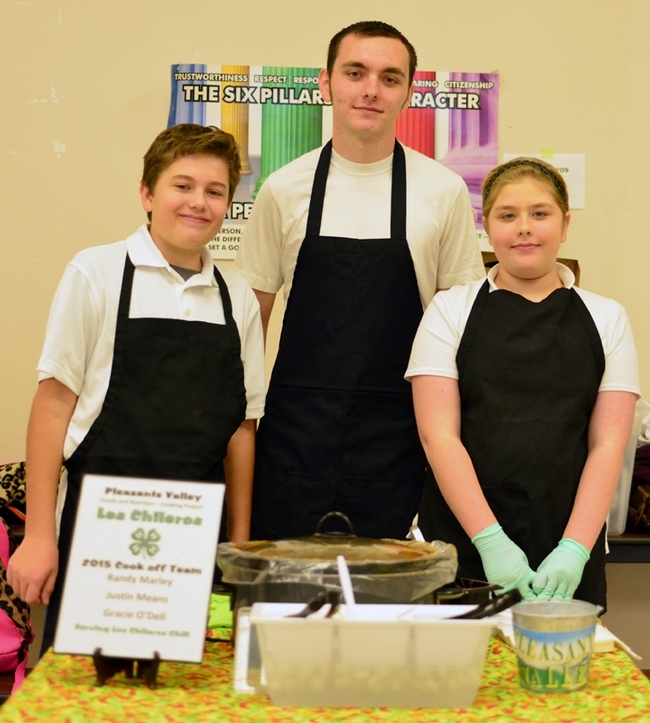 The Chili Dogs, Suisun Valley 4-H Club, comprised of Xavier Copeland, Christopher Lang, and Robert and Clairese Wright. The Los Chileros used both pork and beef and fire-roasted peppers. Another addition was corn, for a southwestern-style chili. Chuck and the Three Frijolitos' recipe opted for beef stew meat and three different kinds of beans: pinto, black and kidney. The Chili Dogs' key ingredients were hot dogs and carrots. Each wore a t-shirt with an image and name of their family dog. They made biscuit-shaped rolls to accompany their chili. In a large stock pot, brown pork in the olive oil. Add the ground beef and continue cooking over high heat until beef is browned, about 30 minutes. Add the water and seasons. Cook an additional 30 minutes. Add tomatoes and beans. Turn down beef and simmer for 30 minutes. While mixture is simmering, coarsely chop onions and peppers and finely copped garlic. Add these to the pot and continue cooking until pork is tender, about another 30 to 45 minutes. Check flavor and add seasonings to taste. If needed, thicken chili with cornstarch. The ingredients "can be adjusted to suit your taste," they said. Brown meat in a skillet and then put in crock pot. Cut vegetables and add to crock pot. Add spices and canned tomatoes and paste. Cook on high for six hours. Add the corn and beans the last 30 to 45 minutes.